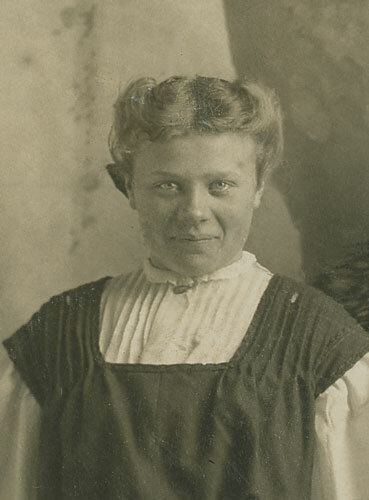 Mabel (Bohnsack) Hammer was the sister of my gg-grandfather, Leo Bohnsack. She was born in July of 1894 in Illinois to Carl Herman Bohnsack and Carolina Sophia Wulff. She was the middle child; my gg-grandfather was the oldest and the youngest was Mary. She married Alvin Hammer on January 22, 1913. Alvin and Mabel had six children: Wilbur, Levern, Alta, Viola, Evelyn and Loren. 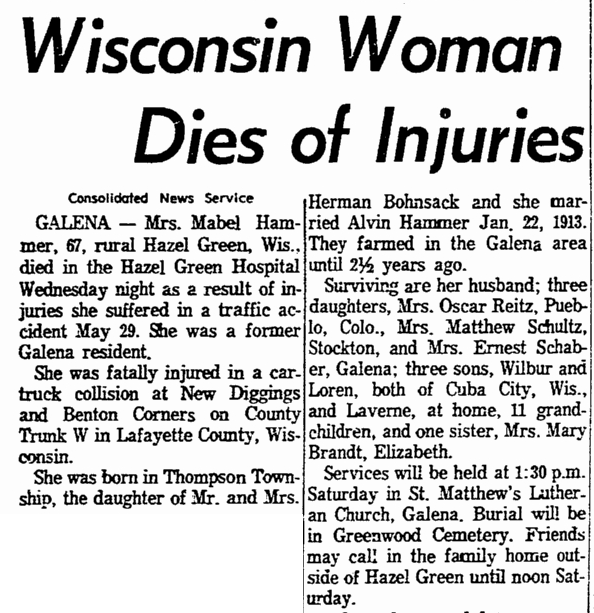 On May 29, 1962, she was injured when her car and a truck collided at a corner stop in Lafayette County, Wisconsin. She died of her injuries on June 13, 1962. She’s buried in Greenwood Cemetery in Galena, Illinois. The announcement of her death was published in the Rockford Morning Star on Friday, June 15, 1962. Mrs. Mabel Hammer, 67, rural Hazel Green, Wis., died in the Hazel Green Hospital Wednesday night as a result of injuries she suffered in a traffic accident May 29. She was a former Galena resident. She was fatally injured in a car-truck collision at New Diggings and Benton Corners on County Trunk W in Lafayette County, Wisconsin. She was born in Thompson Township, the daughter of Mr. and Mrs. Herman Bohnsack and she married Alvin Hammer Jan. 22, 1913. They farmed in the Galena area until 2 1/2 years ago. Surviving are her husband; three daughters, Mrs. Oscar Reitz, Pueblo, Colo., Mrs. Matthew Schultz, Stockton, and Mrs. Ernest Schaber, Galena; three sons, Wilbur and Loren, both of Cuba City, Wisc., and Laverne, at home, 11 grandchildren, and one sister, Mrs. Mary Brandt, Elizabeth. Services will be held at 1:30 p.m. Saturday in St. Matthew’s Lutheran Church, Galena. Burial will be in Greenwood Cemetery. Friends may call in the family home outside of Hazel Green until noon Saturday. This is my Great Grandmother!! !